WEATHER PREDICTOR. It is used to predict the weather in Europe in 19th century. According to the state formed inside this barometer bottle, can predict sunny, cloudy, fog, storms, snow, etc. STYLISH LOVELY DESIGN. A transparent solution consisting of several chemical substances in a cool droplet craft design glass container. A new & modern weather monitors. A lovely table centerpiece with wooden base for any occasions. STUNNING DESK DECORATION. 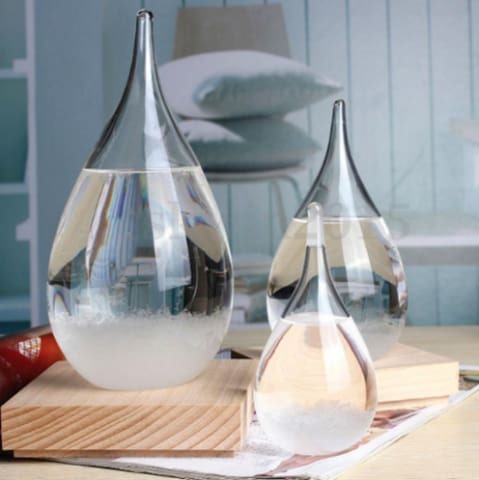 While it can't ever be as accurate or reliable as a barometer or actual meteorological forecast, the patterns made are gorgeous and makes a stunning droplet / teardrop decoration on any desk. A cool crystal glasses room decor. ELEGANT GIFT. A unique and unusual gift for Birthdays, Weddings, New Year’s Day Valentine’s Day, Mother’s Day, Father’s Day, Grandparents’ Day Thanksgiving Christmas Day. A Thoughtful gift idea for friends and family who loves home decorations.